am 25. mai kommt das buch(!) zu „god of war“ in den handel. grob zusammengefasst ist es das videospiel in novellenform. geschrieben haben es matthew stover und robert e. vardeman. 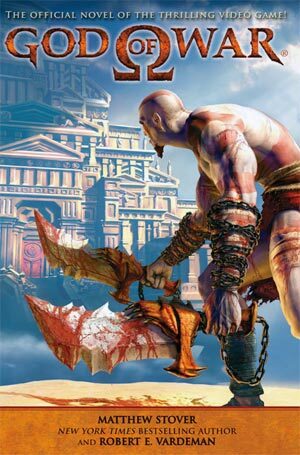 „god of war“, das buch, 17 seiten, PDF, via gow-webassets.scea.com. „Offering deeper insights into the critically acclaimed God of War® franchise, this novel returns us to the dark world of ancient Greek mythology explored in the heart-pounding action of God of War I, the bestselling video game. A brutal warrior, Kratos is a slave to the gods of Olympus. Plagued by the nightmares of his past and yearning for freedom, the Ghost of Sparta would do anything to be free of his debt to the gods. He is on the verge of losing all hope when the gods give him one last task to end his servitude. He must destroy Ares, the god of war. But what chance does a mere mortal have against a god? Armed with the deadly chained Blades of Chaos, guided by the goddess Athena, and driven by his own insatiable thirst for vengeance, Kratos seeks the only relic powerful enough to slay Ares . . . a quest that will take him deep into the mysterious temple borne by the Titan Cronos! bei amazon kann man es vorbestellen. momentan kostet es 10,88€.